Over the weekend, our area was hit by a 6.o earthquake. As Californians, we all know that earthquakes can happen, but it is always a bit surprising when it does and Sunday’s quake was the largest since 1989. In this post, our Northern California earthquake injury law firm looks at two issues relating to earthquakes and the damage they leave behind. First, we look at why earthquake insurance is of limited assistance following tremblers. Second, we turn to the issue of earthquakes and civil liability. Specifically, the second section examines the liability of a property owner for injuries sustained during a quake because the property was not earthquake-safe. An article in the San Francisco Chronicle explains that only a small portion of those whose homes were damaged in the Napa quake will be covered by earthquake insurance policies. Glenn Pomeroy, the California Earthquake Authority’s chief executive, noted that a mere 5% of homeowners in the quake zone compared to about 10% statewide. One reason for the low figure is that mortgage companies don’t usually require earthquake insurance (as opposed to requiring homeowner’s policies). Another key issue is that earthquake insurance typically has a percentage deductible based on the amount of coverage purchased. If a homeowner has a $500,000 policy and a 10% deductible, the insured would need to cover $50,000 before insurance would kick in. One insurance company employee commented that she has yet to come across a homeowner whose damages met this threshold for the recent quake. This May, the Los Angeles Times discussed another crucial issue for our clients — landlord liability and tenant’s rights. The article focused on caselaw developed following 2003’s 6.5 Central Coast earthquake. Two women, California’s most recent earthquake deaths, were working at a clothing store when falling bricks and plaster fell on them as they tried escape, crushing them to death. Their family owners sued the property owners who, in turn, said the quake was an “act of God” and that they were in compliance with the law. At the time, the deadline for seismically retrofitting brick buildings in the city was several years away. Ultimately, the jury found the owners negligent for failing to make the building safer and awarded $2 million to the women’s families. An appeals court upheld the ruling in 2010. The court held that merely complying with city law would not insulate an owner from liability where they negligently failed to retrofit the building. One commentator drew a parallel to lightning damages noting that a bolt may be an “act of God” but an owner would still be negligent for failing to provide fire extinguishers or sprinklers. While earthquake injury/fatality cases had settled in the past, this case created caselaw that can be used to help support future claims. First and foremost, we hope all of our readers and their families are safe and uninjured. 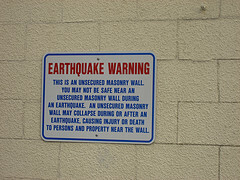 If you do suffer an injury in an earthquake, do not assume you are without recourse. Where a property owners’ negligence creates an unduly dangerous situation, an injured person or the family of the deceased may have a claim. Also, if you do have earthquake insurance, do not sign anything without having your own attorney look over the document. Our San Francisco, Oakland, and Santa Rosa civil injury law offices exist to serve clients throughout Northern California. Call to arrange a free initial consultation to discuss your rights and how we can help you.